Lian Li presents the PC-100, a new case that offers a radical redesign that rotates the motherboard 180 degrees. The company claims this design allows cool air to flow unimpeded across the CPU, chipset and voltage regulation components, and points out that it offers easy access to all connects that are traditionally at the back of your PC. The case will ship within a week or two for around $199. 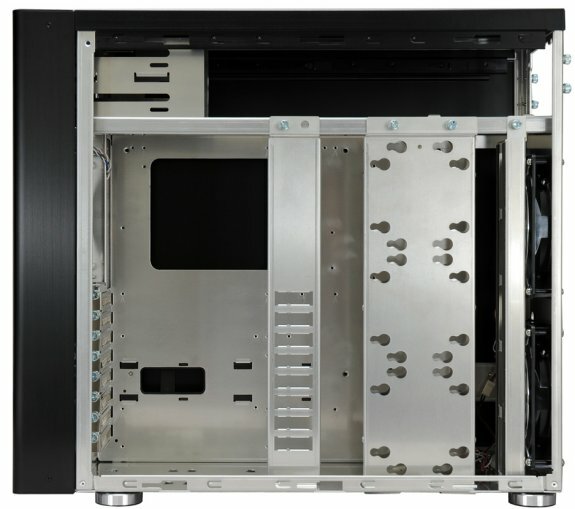 Experienced case maker Lian Li has unveiled a radical rethink of the PC case, the new PC-100. The PC-100 is a long overdue redesign of the traditional PC chassis that improves cooling, prolongs component life, and saves space. This beautiful and compact mid tower case is roomy enough for the longest graphics cards and largest E-ATX/XL-ATX/ATX motherboards, thanks to its innovative layout. It is also remarkably easy to assemble without tools. 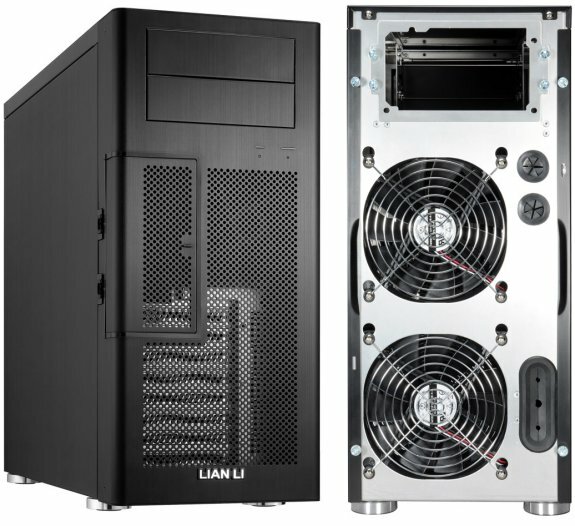 Lian Li's innovative PC-100 is a breath of fresh air for the stagnant PC case market. Superior cooling helps CPUs and graphics cards run at maximum speed without slowdowns or crashes due to overheating. This also means higher speeds for overclockers, and extends the life of disk drives and motherboards. However, traditional case layouts have two serious barriers to optimal cooling, performance, and ease-of-use: firstly, they block airflow with a wall of hard disk drives inside the front of the case. Secondly, important ports and connectors are at the back, making them difficult to access – a defect that manufacturers can only try to address by adding a few front panel connectors. The PC-100's radical redesign solves both these problems. For the first time, a case is available that provides a clear path for cool air to flow unimpeded across the CPU, chipset, and voltage regulation components, forcing heat out of the case with maximum efficiency. The result is a dramatic improvement in cooling performance with standard PC parts, and no extra cost. The PC-100 actually needs less space than competing cases, but provides a less cramped interior, easier access to external connectors, and a shorter, more direct path for airflow. Two Lian Li innovations have made this breakthrough in cooling possible. In the PC-100, the motherboard is rotated 180 degrees. So all those hard-to-reach connectors at the back of traditional PCs are now easily accessible at the front of the PC-100, and the graphics card is much closer to cool air drawn in at the front. Meanwhile, the hard disk drives are moved to the side of the case from their traditional location at the front (similar to Lian Li's recently released PC-90 chassis). The airflow direction remains the same, from the front of the case to the back, driven by two large, quiet 140mm fans filling the rear of the case, and another 120mm fan at the front. Despite this radical redesign, there's less cable clutter. The front panel keeps things neat, with a cable access door. If necessary, any cable can still be routed to the rear or side internally through ducts, so no extra cables protrude from the front of the case and the front panel can be opened without unplugging cables. The PC-100 also offers enhanced hard drive cooling. With the top side of three hard drives now arranged flat against the outside of the case, they are able to radiate heat directly to the outside over a bigger surface area, instead of being crammed together in a stack as they are in traditional cases. And there's still unimpeded airflow moving across every drive. Unobstructed airflow reduces noise, as well as keeping the PC cooler. To further control noise and vibration, there are rubber anti-vibration pads under the case, and the disk drives are isolated with rubber strips on the hard drive tray. All the neat Lian Li features that buyers have come to expect are still there, like washable air filters, a graphics card holder for stability and protection, and water cooling ports. There's space for up to 8 full sized drives and 8 expansion slots. For removable and optical drives, there are two bays at the front of the case – at the top to avoid obstructing air flow. Cool both inside and out, the PC-100's classic black anodized aluminum construction and smooth, rounded lines provide the perfect understated complement to the technical wizardry concealed inside.